It is well-known that the significant part of playing strategies is the right choice of the game type. What are notable about blackjack, there are numerous variations of blackjack to choose from. Moreover, it means that you will never be bored with this game, as each type has its own peculiarities. 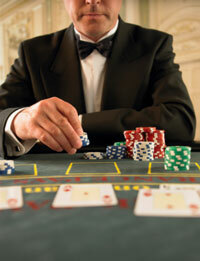 Of course, the greatest choice of variations of blackjack can be found at online casinos. We will list the most popular types of this game and feature their specifics, which you have to know in order to build the playing strategy. The peculiarities of Spanish 21 is that there are no "10" cards in the deck and the player with 21 points always wins against the dealer's 21. The gamer has the right to double on any of cards combinations, even if they have hit. The players can surrender after doubling, splitting or hitting. There are some differences in payouts, when you get 21 points. If you manage to reach 21 points with 5 cards the payout rate will be 3:2, if 6 cads - 2:1, and 7 cards or more give you the reward of 3:1. When the hand is 3 cards of combinations 7-7-7 or 6-7-8 of different suits, the payout is 3:2. The combination of the same suit pays out 2:1, and if the hand is of all spades the payout rate is 3:1. The specific of this game is you get some extra payouts for a certain combination of the first two cards. If you get a jack and an ace of spades, the winning is 50:1. Any other jack and ace of the same suit gives the reward of 25:1. Two cards, which have the same suit, are paid as 5:2. It is worth saying that the amount of bonus is not influenced by outcome of the game. This type of blackjack gives players the opportunity to play not one hand but several of them, which is very favorable. This twist makes the risk lower and the profits bigger. However, this type of blackjack can be found only in some of online casinos. The main feature of Double Exposure is you can see both cards of the dealer. It makes playing strategies more efficient and the players have more advantages over the house. Due to this fact there are many other rules. The dealer wins all ties, except in the case of a blackjack. The player can double only on hard 9 and 11. The gambler is allowed to double after split. There are many other variations of blackjack that are popular with players, for example Classic Blackjack, Vegas Strip, Atlantic City, European Blackjack etc.